Food, treats, strong & reusable toys, durable cages, essential accessories and supplements for your Cockatoo parrot. Find everything you need for your pet Cockatoo right here. Choose from a wide variety of foods & treats, cages, strong, interactive toys, accessories and supplements to keep your Cockatoo healthy and mentally stimulated. Fast dispatch and quick delivery and all orders! 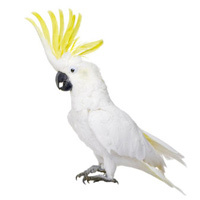 Cockatoos are great pets for bird lovers. Many commonly kept species include Umbrella Cockatoos, Moluccan Cockatoos, and the Sulphur-crested Cockatoo. Since these birds are considered highly intelligent, there is a lot of thought and care that goes into providing for your Cockatoo. Whether you’re looking for challenging toys, rewarding treats, or high-quality food, you can find just what you need to keep your Cockatoo happy and healthy by shopping at Parrot Essentials. Since your Cockatoo is so intelligent, toys are a great way to keep your bird entertained and mentally stimulated. We offer toys for chewing, shredding, picking, swinging, and more. When playing, your Cockatoo is sure to forage as well. When this happens, placing treats inside the foraging toys can help you keep your cockatoo occupied and playing for longer. Speaking of treats, browse our large selection. Treats can be awesome training aids or can be given for the days you just want to spoil your feathered friend. Though treats are a great way to mix up what your bird eats, finding a seed, soaking mix, or complete diet for your Cockatoo is essential. You’ll find we have many foods and brands that are packed with the necessary vitamins and minerals that fit with your pet’s daily requirements. Our tasty selections work well for your cockatoo and promote a strong immune system, making feed times something to look forward to by bird owners as well. Explore our different supplements that we carry and achieve a well-balanced diet for your cockatoo with any of our products. From powdered mixes for food and refreshing sprays, to palm oils, creams, and many more. Whether you’re an experienced Cockatoo owner or just starting, you may already know that Cockatoos have powerful beaks. Choosing a cage that’s strong and of good quality is extremely important. In doing so, you provide a safe and secure environment when they’re spending time inside their cage. Our cages are top notch, exhibiting premium security, adequate dimensions, and efficient designs. Choose from cages that come with accessories like stands, feeding bowls, and easy maintenance and cleaning options with removable trays. Other cage specific features include open top, play top, and dividers. We also have a selection of travel cages that will be perfect for your cockatoo, with compact styles for easy carrying.